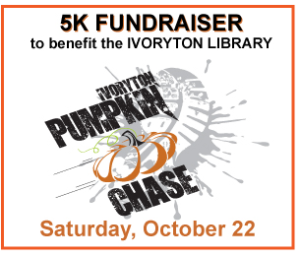 Join the Ivoryton Pumpkin Chase 5K Today! You are here: Home / Towns / Essex / Join the Ivoryton Pumpkin Chase 5K Today! IVORYTON — The name has changed and the route is slightly different … but the seventh 5K Road and Trail Run/Walk Race — now called the Ivoryton Pumpkin Chase — will still travel through beautiful Ivoryton on Saturday, Oct. 22. This benefit for the Ivoryton Library will be fun for families, walkers and runners from this area and across Connecticut. changed, based on changes made to the trails by the Essex Land Trust. Registration begins at 7:30 a.m. for all walkers and runners. Awards will be given to the top male and female 5k runners, the top walker, top male & female runners in 10 age groups (no duplicates), and the best Halloween costume, male, female and group. required.) The 5K will start near the Ivoryton Library at 9:15 am. 50-59, 60-69, 70 & up. predict your time. Prize for the closest time! Tired of medals and trophies? Fresh baked apple pies for the winners! The first 150 registrants for the 5k will be receive t-shirts. PUMPKIN RUN: $5 per child. All are invited to join us on Saturday, Oct. 22 to run or walk the race, or just cheer on the racers! The library is grateful to all the volunteers who help us and we can use more, Please consider helping out for a few hours Saturday morning! Any questions or to volunteer, please contact the library at 860-767-3460 or staff@ivoryton.com. Online registration or downloadable applications are available on the Ivoryton Library website (www.ivoryton.com) or at the library. Please make checks or money orders payable to the Ivoryton Library.